An all inclusive solution for beginners? Maverick Audio is a new HiFi Company which is based in Hong Kong. They both sell directly and via authorized distributors available worldwide. Maverick Audio offers, at present, just two products: the D1 (now D2), a SPDIF/opt/USB 24bit/96 kHz DAC that also acts as tube headphone amp and minimalist tube preamp and this A1 I have under test, a small integrated amplifier, with a tubed preamp section (that can work stand-alone, if you wish), a built-in tube headphone amp and a Class AB power section built around a National LM1876T chipset. A very versatile product, indeed. The TubeMagic A1 is a very particular product, considering all of its features. It offers a tube preamp section (with two 6J1 tubes) and a solid-state chipset-based power section (National LM1876T). You can use the preamp section separately via the Tube Pre Out outputs. It has two switchable line inputs, one in the rear and one in the front, and one headphones output jack. Since I don't use headphones, this section of the A1 hasn't been tested. If you don't need all of these features, just use it as a standard integrated amplifier! Claimed output power is 20 watt on 8Ω and 40W on 4Ω. Optimistic, to say the least: read below for more details about real world figures. For a 4Ω load, and with ±20V supplies, the LM1876 can deliver typically 22W of continuous average output power with less than 0.1% (THD + N). With supplies above ±20V, the LM1876 cannot deliver more than 22W into a 4Ω due to current limiting of the output transistors. Thus, increasing the power supply above ±20V will only increase the internal power dissipation, not the possible output power. I strongly suggest to have a look at the datasheet, it's plent of technical details, graphs etc. 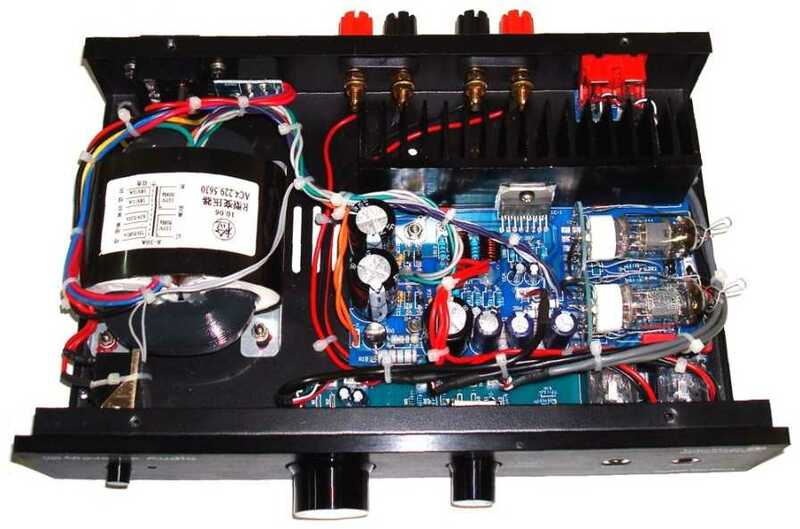 It will tell you anything you might wish to know about the power stage of this amplifier. The power supply section makes use of a pair of 4700 uF (35V) caps and a 80 watt R-Core trasformer with multiple secondaries, separated for the tube stage and the LM1876 chipset. There is an output labelled as ±18V, I guess this is used to feed the LM chipset. In this case this would be underpowered, since nominal supply voltage should be ±20V. Consenquently, the LM1876 might not be able to deliver its maximum power output of 20 watt on 8Ω. The chipset is installed on a large heatsink, which is very, very close to the tubes, certainly not the best solution. While it is claimed the amplifier is equipped TungSol tubes, my test sample was equipped with Chinese unbranded tubes. Actually, browsing the manufacturer website, I've discovered the TungSol tubes ran out of stock in October 2010 and a pair of JHY-Hytron 6AK5 was supplied instead. No mention to the Chinese unbranded tubes that seem standard now on this amplifier (or so the Italian distributor replied to my question). I'd strongly suggest the Manufacturer to clarify the situation once and for all. Does this amplifier come with unbranded Chinese tubes? If yes, delete all the references to NOS tubes that might be misleading. An upgrade kit, actually a pair of selected NOS Raytheon 6AK5, is available (cost: 70 € here in Italy). Alternatively you can purchase the upgraded version at a higher cost. The TubeMagic A1 is a very small unit (26 cm x 5,5 cm x 16,7 cm, weighing in just 2,6 kg) which appears to be quite nicely crafted and solidly built. The aluminium front fascia is thick and speaks business :-), then you have gold-plated RCAs, versatile, good quality speaker binding posts and even an IEC standard mains socket. The front fascia hosts the input selector (two line inputs, front and rear), the microstepped volume pot, the on/off switch, the ubiquitous blue led, and the headphone jack output. In the rear there's also a voltage switch (230V/110V). Having a look at the inside you can notice a rather simple construction, with the R-Core transformer on your left and a single PCB on the right. Wiring could be run in a neater way. The tubes are installed horizontally, because of the reduced total height of the cabinet. Four, stiff and ugly rubber feet should isolate the unit from the outside world. The whole package contains a rather complete owner's manual, a minijack cable and a minijack/jack adapter and the mains cable. Purchasing this TubeMagic A1 is rather easy. Either you can ask the manufacturer or purchase it directly from one of the available official distributors. When a local distributor is available, you can't purchase the amp directly from the Manufacturer, which seems quite logical to me. The amp costs, if purchased directly from the manufacturer, 199$ (November 2011), but your mileage may vary. For example, in Italy it costs much more (260 €!). The higher power output of the TubeMagic convinced me to compare it head to head against the Dayton DTA-100a, a small Class D amplifier with two line inputs and nothing else. You can find results of this direct comparison even on the Dayton review, whenever a hybrid amplifier is mentioned. The not negligible price difference (70$ against 199$) can be justified if you consider the TubeMagic is a three-into-one unit: an integrated amp, a minimalist tube preamp, a tube headphone amp. This amplifier is generally warm sounding and smooth. I'd say it sounds quite far from the Class D amplifiers I've compared it to. I don't know if this depends on the fact the TubeMagic uses a tube preamp stage or because it is NOT a Class-D chip-amp (the LM chipset is NO class D). In any case, the difference is NOT subtle. The mid-high range has that velvet touch that many audiophiles might find amazing, voices are always smooth and never harsh and so the string instruments, which I've found to be even too sweet sometimes. The pizzicato, for example, doesn't appear as metallic as it should be, perhaps because of a certain lack of higher harmonics. More or less, the same happens with saxophones, trombones amd trumpets, which flow smoothly even if, sometimes, they should sound harsh (ever heard a trumpet played right in front of you? :-)). Generally, I've had the feeling as if something was missing in the mid range: a bit of lack of presence effect, for example. The bass range is generally good, but when compared to the wild Dayton DTA-100A, you feel something is lacking: power, extension, tightness and articulation. The Dayton beats the TubeMagic hands down in this area. For example, the electric bass notes with the TubeMagic appear a bit monotone, while the kick drum is sometimes too light. Anyway, the bass performance does possess some logical coherence: it has a good presence, though definitely it is NOT of the walls-shaking kind, and is sufficiently lively with most musical genres. For sure, the wild power of the bass and drum parts of Rage against the machine's first album, just to cite an example, is lost. Summarizing, I think this amplifier will be acclaimed by audiophies searching for a smooth and warm (maybe laid-back) attitude. It would be a perfect partner for bright speakers or rooms: the excess of mid and high range will be greatly reduced using this amplifier. Even lesser recordings might sound acceptable. Of course there's a price to pay: do not expect the transparence, pace and liveliness of the Class D amplifier I cited above, quite the opposite! It is not surprising the Manufacturer aimed exactly at this kind of result. The power output is sufficient for mid-sensitivity loudspeakers placed inside mid-sized rooms. This amplifier can sound loud, but its heart is a chipset that might run out of steam on heavy loads or at very high listening levels. Moreover, its laid-back nature dosn't help to underline the strongest dynamic jumps. As soon as the musical program becomes more and more complicated (many instruments playing at the same time) it suffers. As soon as things become easier, its sound breaths and flows again effortlessly. This means the LM1876 is a quite good sounding chipset but you can't expect too much in terms of pure dynamics. Perhaps the unbranded Chinese tubes have some part of responsability here, one might try to experiment with better tubes. Bass range aside, which isn't exactly devastating :-) the lack of dynamics can be detected in the mid range too: the snare drum, for example, which should sound fast and punchy, gets reproduced with a lack of liveliness that lets you ask for more. In the microdynamics department things are a little bit better as this amplifier offers a good amount of detail, always with that smooth character that makes everything sit on a velvet pillow. A rather bizarre performance here. While the width of the soundstage appears to be quite good, well extended beyond the loudspeakers (laterally) the depth and, in particular, the height of the soundstage are merely sufficient. Hence you get a rather good stereophonic effect (well defined right/left sounds and positions) but when it comes to detect horizontal planes things become trickier. Everything seems to be projected onto a sort of a vertical plane between the speakers. There's a small attempt to some depth but if you're used to the wide, 3 dimensional, realistic soundstage of the Trends Audio TA10.1, just to name one of the competitors, you'll be greatly disappointed. The focus of the virtual image is good but the whole stage doesn't help placing singers and instruments in a precise spot. Summarizing, the whole imaging performance is barely sufficient. Since this is a hybrid amplifier, a particular care should be taken with warm-up and break-in procedures. Moreover, I'd try to use feet with better damping properties. This is not difficult, considering the stock ones are as stiff as a piece of concrete :-) [not good for a tubed component!]. For this reason I'd avoid placing the amplifier close to the loudspeakers, for example as in desktop use! If the upgrade bug will bite you, feel free to experiment with different tubes, for example the NOS ones supplied by the manufacturer. Avoid spending silly money on tubes, do not forget that the following stage is just a cheap LM chipset. You should be careful with speakers matching: considering the power output (20 watts, more or less) you might need rather sensitive speakers (around 90 dB), if your listening room is large (bigger than 20 sqm) and if your usual listening levels are high (close to 100 dB during peaks). From a purely electrical point of view, please don't forget this amp has current limitations at 4 Ohm, so choosing a speaker with a low impedance might be a risk. If the minimum of the impedance is way below 4 Ohm you might be in trouble. Stay closer to 8 Ω and you'll be home and safe. Finally, consider its tube line preamp stage might help smoothing (too) bright power amps. In any case, I wouldn't purchase this amplifier with the sole intention of exploiting its minimalist tube preamp section. As it always happens, I HATE an amplifier which is claimed to deliver more power than it actually does. The 40 watt @ 4Ω claim is TOO FAR from reality (22 watt) to be tolerable. The manufacturer should correct the claimed tech specs accordingly. Also, it should be clearer which kind of tubes are used inside. From a strictly engineering point of view I remark the tubes and the power chip heatsink are too close one to the other. Take a car, for example: would you install the radiator close to the muffler? I wouldn't. Moreover, the tubes aren't isolated from vibrations: their position is wrong and the stock feet are too stiff = zero damping. In the rear, the two pairs of input/output RCAs are too close: using bulky cables or connectors might be a problem. Generally, the quality of the passive components used inside is adequate to the price tag. The quality of the finish is good, but the internal wiring isn't exactly an example of good layout. The biggest limitation, which might sound as a virtue for others, is the lack of spark, verve, liveliness. For example, the bass range should be tighter and punchier (and even more extended! ); the mid range should have a better presence effect; the high range should be brighter. Overall dynamics should be more explosive. This kind of sound, so relaxed and laid-back, might be annoying in the long run, especially with certain musical genres (pop, rock, hard rock etc.). On the other end, with different musical genres and with certain partners this character might be a good compromise. At least, listening fatigue won't ever be a problem. Unfortunately real Music isn't always so warm and smooth! I've found this amp rather interesting and substantially pleasant to listen to. It makes you tolerate even bad recordings, and this is a plus. Its quality/price ratio is good considering it is a three into one device but the question remains: who needs a tube preamp, an integrated amp and a tube headphone amp all at the same time? Don't forget it just possesses two line inputs! For more or less the same amount of money you can purchase a standard integrated amplifier like the Denon PMA510AE or the Onkyo A9155: both offer much, much more! More inputs, phono MM included!, more power and even a remote control! To cut a long story short: if you need the three main features this amp has to offer, it represents a very good choice (perhaps the only one at this price!). Otherwise, if you just need a simple integrated amp, have a careful look at the market...there are many alternatives.